Claiming that this is their only means of livelihood, the touts have promised that they would operate in a professional manner. This supposedly would mean that passengers, particularly women and schoolgirls, would no longer be tugged or verbally abused. However Police Traffic Chief, Linden Isles in a recent interview declared that his department will turn up the heat until order and discipline is restored on the bus parks. 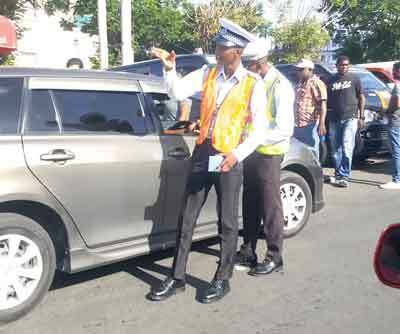 While touts claim they engage in this activity because of unemployment, both police ranks and members of the public say that there are many other jobs available. Commenting on promises by the touts to operate professionally in future, most commuters suggested that they will only “boil down for a while” before returning to their old habits. Rather than being lenient with the touts, commuters urged the police to have more traffic ranks on the bus park by night, since that is the time that the touts are on their worst behaviour. Some suggested that many of the touts are either criminal elements, or collude with gangs to relieve passengers of their valuables during their ‘tug-o-war sessions’ with commuters. Kaieteur News was informed that the touts are also harassing commuters using the ‘short drop’ cars. Traffic ranks, who have taken flak for never sustaining their campaigns, are appealing to the public to resist being bundled into buses against their will. They are particularly appealing to youths to not ‘bus ride’ when encouraged to, and not to ‘double up’ in seats, particularly at the urging of the touts. The police crackdown on the touts began after Kaieteur News highlighted the lawlessness at the bus parks. The Police Traffic Department began using policemen in civilian clothing at the parks. The unsuspecting touts were caught off guard and were bundled into waiting police patrol cars, by both plainclothes and uniformed policemen.